This post contains a couple of new general bulletin board ideas. They were created by several different people and they have allowed me to share them with you. I have posted them in basically the order they were added to the church building walls. Thanks to everyone that permittedd me to use them! I saw the idea for this bulletin board when I was driving down the road. 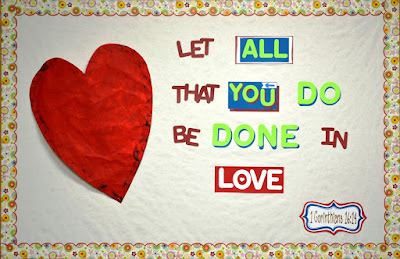 The saying was on a church building sign and I wrote it down and said that I found my next bulletin board idea! "The Best Medicine for a Christian is (to) B-1". I do have the printables for you. I used an overhead projector to enlarge the medicine cup & bottle. Directions are included in the download. Click here to print everything. This bulletin was done by Judy Deising. The scripture is Hebrews 10:24. 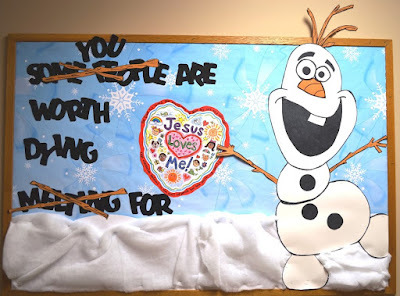 I loved this Olaf bulletin board by Carren Marvin since we love Frozen! And, it is totally different from bulletin boards that I create! The heart can be found at your local teacher's store and she used quilt batting for the snow. This is the bulletin board I did for the teen classroom. Depending on the border you decide to use, and the color of the heart, it could be used for a hallway also. I have done this same scripture with several different variations. For the large heart, I used a piece of posterboard, cut the heart as big as I could. Then I squished it up and wrinkled it as much as I could to give it the texture. Then, I painted it. Once the paint was dry, I used a stamp pad along the edges. I cut the letters with Cricut Learning Curve. I used the colors in the border to accent different words. The arrow and the white heart in LOVE are brads found in the scrapbooking department. 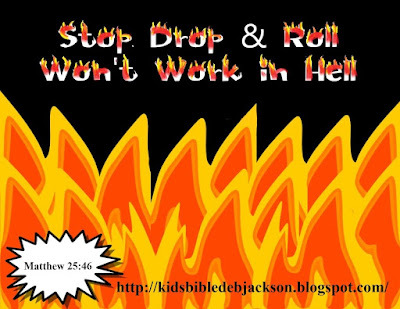 When I saw the bulletin board idea for "The Best medicine for a Christian is B-1", and I was writing it down, because seriously, I would have forgotten it, my niece said "Here is another one... Stop, Drop & Roll Won't Work in Hell!" Thanks Maddie! I don't have an open bulletin board that I can put this on right now, so I made this graphic to show you how it can look. You can download the FLAME font free here. You can download the free flames graphic here. 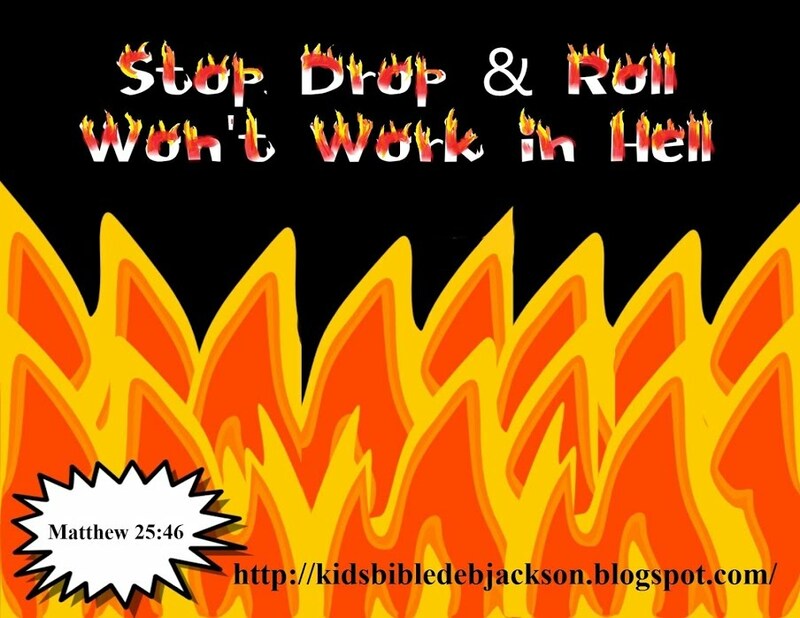 You can draw the flames by hand, or print the graphic and use an overhead projector to make them the size you want. The words will be plain, to make the fire on the ends, I use red, yellow, and orange stamp pads. But, like any craft, there are different ways to get the effect you will want. This Love bulletin board was done by Cathy Ross and she used 1 Corinthians as the scripture. 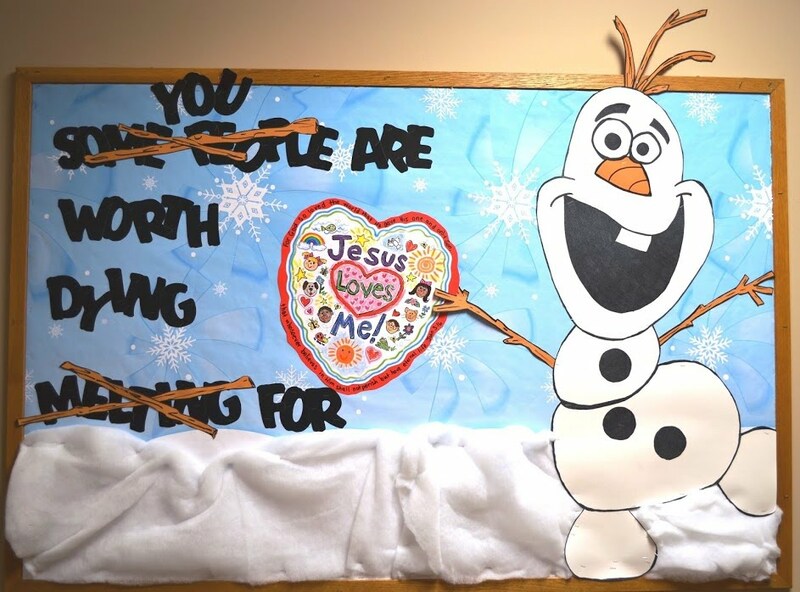 This heart bulletin board was done by Judy Deising. The title is Give Me a Heart of a Servant. The center heart has John 13:3-5. The small random hearts have some of the works our congregation is a part of that members can assist with. This is our theme for 2015. It's about being spiritually alive and doing God's work in 2015. This bulletin board is patterned from the Power Point graphic that is used when discussing this year's theme. The whole time I was working on it, I was thinking of someone else that is so good with this type of design, and I should have asked her to make it! But, I used different colors of paper for the background. I tore it to make it look more like the graphic. I squished some of it and then spread it out to make some of it with texture. Some of the landscaping was painted. The trees in the front and the sign are found here. The sign has the scripture and is Ephesians 2:4-6. Another February bulletin board is a Pinterest find! This board was done by Arinne Alsup. Following the Pinterest trail, I think the original person that posted this idea is here.